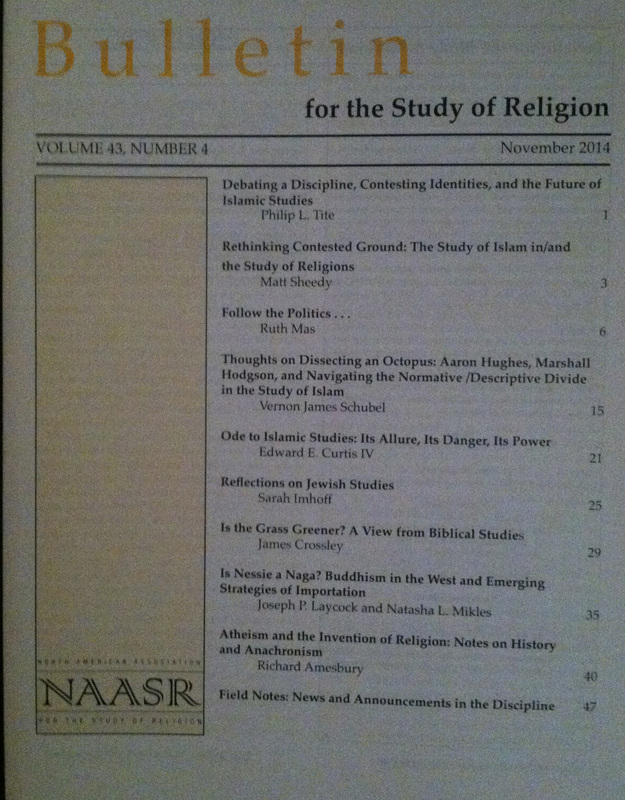 The following is Matt Sheedy’s introductory essay for the panel of articles on the state and future of Islamic studies, which appears in the November 2014 issue of the Bulletin for the Study of Religion (the full table of contents and editor’s introduction having already been posted). We offer Matt’s essay here on the blog in order to give readers a taste of this set of articles. In the course of the article, in which he [Safi] expressed his concern regarding unreconstructed orthodox Muslim voices entering the American academy, he stated that Hughes and two other scholars had written “pieces attacking and critiquing the prominence of Muslim scholars in the Study of Islam Section.” Specifically, he described Hughes’ piece as “grossly polemical and simplistic.” In response, Hughes characterized Safi as calling him a racist, and demanded that he “do what the Western tradition of scholarly discourse demands and respond to my ideas in print as opposed to engaging in innuendo and identity politics.” He further suggested that Safi may have been motivated by Hughes’ Jewish background, adding sarcastically, “[w]e all know that Jews are the arch-enemy of Islam.” (“Omid Safi”). Not surprisingly, Barthes’ “death of the author” is on full display here, as this “dispute” is presented in sound bite form and reduced to identity politics, thus distorting what is at stake for both Safi and Hughes. Given the form and medium of blog writing, these posts are perhaps best characterized as provocations or challenges that need to be supplemented by a closer examination of the work of both authors and the larger academic fields in which their ideas reside. The collection of essays presented here attempts to situate the ideas and concerns that Hughes and Safi raise in their respective pieces and place them within a broader framework of theoretical, ethodological, and political debates within the sub-field of Islamic Studies, and in the broader study of religions. These contributions are therefore not limited to Islamic studies, but also include a scholar of contemporary Judaism and a scholar of Christian origins in order to highlight the interdisciplinary nature of these concerns. Safi opens his remarks by noting how he had been asked to share his thoughts on Jadaliyya about the “state of Islamic studies in the North American academy,” and proceeds by tracing an arc from his graduate work in Islamic studies in the early 1990s, when most students were “converts” and jobs in Islam were few and far between, to the present-day state of the field, where he finds both drastic improvements as well as problems still in need of redress. In light of this history, Safi remarks that he is pained to see scholars of Islamic studies today, especially Muslim scholars, “who move through the discussions of normative/descriptive approaches to religion without an awareness of how much effort has gone into working out the uneasy compromises in the religion academy.” Indeed, it is Muslim scholars in particular with whom he appears most concerned, especially those who “dismiss minority opinions in the Islamic traditions” in favor of a particular normative (theological) position. In this context, Safi also notes a backlash from other scholarly quarters, which is where his comment about Hughes appears. One indication of the rising prominence of Muslim scholars of Islamic studies is that over the last few years we have seen three separate pieces attacking and critiquing the prominence of Muslim scholars in the Study of Islam Section. These have ranged from friendly concern (Richard Martin’s) to inaccurately outdated (David Freidenreich’s) to grossly polemical and simplistic (Aaron Hughes’). Yet the increasing frequency of these attacks/responses from non-Muslim scholars is one indication that something fundamental has changed. These lines are followed by remarks about the influx of women and scholars of color in the Islamic studies section at the AAR, which Safi lauds as “remarkable achievements,” while stressing concern with the lack of theoretical knowledge among Muslim graduate students. Given the importance and prominence of the study of Islam within religious studies since 9/11, Safi cautions Muslim scholars to avoid proselytizing and adapt to the broader theoretical aims of religious studies at the risk of becoming marginalized or irrelevant. For Safi, scholars such as “Sherman Jackson, Amina Wadud, Jonathan Brown, Kecia Ali, [and] Ingrid Mattson” are all models of those who have been able to work effectively between the “academy” and the “community,” which he upholds as a path for the future. Hughes notes how he has criticized Safi in print (see Hughes 2012, 13, 16, 17, 20-3, 24, 34, 111-12, 120, 128) for his “historically inaccurate portrayal of Muhammad” and thus has provided evidence for his claim of Safi’s bad scholarship. It is based on a misreading of the sources, of wanting to find solid ground when all we possess is quicksand, of engaging in hermeneutical legerdemain. I counter his utopic vision with a dystopian universe. And I do so, moreover, with fact and with argumentation, not with insinuation. I don’t care whether he is a Muslim, a Christian, a Jew, a Buddhist, or a member of the Seneca First Nation. I care about scholarship. I do so because, as a scholar, my first commitment is to uncovering truth. Not to apologetics; not to wishful thinking. Hughes takes issue with Safi calling out scholars of Islam who also hold positions in Jewish studies, such as himself and David Freidenreich, and wonders whether he is trading in innuendo and identity politics here and thereby reinforcing a line in the sand between insiders and outsiders (i.e., Muslims and non-Muslims) within the study of Islam? Moreover, he asks for evidence as to why Safi feels that his work is “grossly polemical and simplistic” and challenges him to back up his claim with argumentation. While this short, informal exchange between two leading contemporary scholars of Islam does not by itself tell us much about their work as a whole nor resolve the issues that they raise, it does offer a glimpse into some of the overarching concerns that have troubled the institutional study of religion since its formal beginnings in late-nineteenth-century Europe, including the lines between insiders and outsiders, between critique and identity politics, theology and apologetic scholarship, along with the search for historical-critical and comparative theories and methods that can offer a model for the study of religions as a whole. The contributions here do not, of course, resolve these debates, but rather contribute to an ongoing conversation. Vernon Schubel’s piece, “Thoughts on Dissecting an Octopus,” comes down firmly on the side of Safi and challenges Hughes with reference to two of his recent books. While partly agreeing with Hughes’ call for greater attention to issues of theory and method, along with more careful attention to the lines between insiders and outsiders, emic and etic, approaches, Schubel advocates a blend of “normative and descriptive approaches,” where the scholar of Islam (or any other tradition) shifts between her personal (theological and/or political) and theoretical commitments. Put concisely, Schubel argues that Hughes represents the “critics not caretakers” position of Russell McCutcheon, along with such critical theorists as Talal Asad, Bruce Lincoln, and Jonathan Z. Smith, whom he criticizes for reducing believers to mere “data.” Schubel, by contrast, sides with the likes of Robert Orsi on “the place of humanism and morality in religious studies,” and the influential scholar of Islam Marshall G. Hodgson, whose book The Venture of Islam is upheld as an exemplary model. Sarah Imhoff’s essay, “Reflections on Jewish Studies,” offers a comparative look at how Jewish studies and Jewish identity have been situated within the broader framework of religious studies since the 1960s, in the hope of providing “fruitful parallels” with “many of the larger issues at play in Islamic studies.” Imhoff discusses the unique identity politics of Jewish studies and how it ties in with earlier narratives of Wissenschaft des Judentums and post-1960s developments within the North American academy. Specifically, she is interested in describing how Jewish studies found its place within religious studies departments that were then-dominated by Protestant theologies, and how this has contributed to a unique and even strangely “scientific” emphasis within the field of Jewish studies that is still, somewhat paradoxically, dominated by Jews. James Crossley presents another parallel example with his essay, “Is the Grass Greener: A View from Biblical Studies,” by looking comparatively at issues within his own field of Christian origins, especially those involving “emic-etic tensions.” Drawing on examples of the reconstruction of the “historical Jesus” that have taken place within biblical studies over the last two hundred-odd years, Crossley notes that these debates are still largely framed by theological concerns. While clearly coming down on the “critics” side of the ledger (as opposed to “caretakers”), and thus siding with Hughes, Crossley wonders what the future will be for those looking to reconstruct the “historical Muhammad” and asks whether such a goal is best pursued by a sharp division or a uneasy cooperation with those who hold ideas that one does not necessarily like? Pulling things together, part of what is at stake here is not just the study of Islam, but how we as scholars—as insiders and outsiders in some way or another—can most fruitfully go about theorizing and comparing those desiderata we call religion, of which Islam is an increasingly influential and contested part. Given the current environment of heightened conflict in Muslim majority countries, which includes on-going interventions by Euro-Western nations, as well as problems associated with “home-grown radicalization” linked to Islam in Europe, North America, and elsewhere, these debates are certain to take on ever-new dimensions, making the need to clarify the boundaries between normative, descriptive, and explanatory claims more important than ever. Hughes, Aaron. 2012. Theorizing Islam: Disciplinary Deconstruction and Reconstruction. Durham: Acumen Publishing. _____. 2014. “When Scholarship is Just Bad Scholarship.” Bulletin for the Study of Religion Blog. Accessed October 2014. http://www.equinoxpub.com/blog/2014/02/when-bad-scholarship-is-just-bad-scholarship-a-response-to-omid-safi/. “Omid Safi.” n.d. Wikipedia. Accessed October 2014. http://en.wikipedia.org/wiki/Omid_Safi. Safi, Omid, 2014. “Reflections on the State of Islamic Studies.” Jadaliyya. Accessed October 2014. Available at http://www.jadaliyya.com/pages/index/16269/reflections-on-the-state-of-islamic-studies. This entry was posted in Academy, Announcements, Editorial, Matt Sheedy, Reflections on Islamic Studies, Religion and Society, Religion and Theory, Theory & Religion Series, Theory and Method, Theory in the Real World and tagged Aaron Hughes, biblical studies, Bulletin for the Study of Religion, Edward E. Curtis IV, emic, etic, Islam, Islamic studies, James Crossley, Jewish studies, Judaism, Omid Safi, Qur'an, Qur'anic studies, Religion, religious studies, Ruth Mas, Sarah Imhoff, scholarship, Vernon James Schubel. Bookmark the permalink.